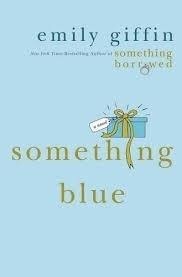 In honor of the recent release of Emily Giffin’s seventh novel, The One & Only, of which I am eager to delve into, I took a step back to the beginning of her writing career and reread her second novel, Something Blue, the sequel to Something Borrowed (will she ever bring back those characters again? ), which brings back the beautiful, but self-centered Darcy as she travels to London to seek the comfort of her friend Ethan and start a new life away from New York, away from her ex-fiancé, away from her former best friend, and really, away from everyone who didn’t agree with the way she was choosing to live her life. With her impending motherhood, will Darcy be able to change her life for the better, or will she stay stuck in her ways? What I love about Giffin is that not only is she great at getting the chick-lit story right, but she’s also a good writer which you don’t see a lot in that genre. Even though her stories have a light air to them, they also possess great strength and always make me take a step back and examine certain things about myself, decisions that I’ve made or haven’t made. All of her characters grow in one way or another. Take Darcy for instance. In the first novel we see her in she is extremely self-centered. She’s that way too in the beginning of Something Blue, but eventually learns that life can’t always be that way, and that if she were to stay on the path that she was going, she would never actually be happy. It’s a hard lesson for anyone to learn, but a valuable one. I leave you with a quote from the novel. In Emily Giffin’s Love the One You’re With, she explores the idea about what could happen if the one who got away resurfaced. How would you react to the situation? Would you let that person back into your life, or would you close yourself off and run in the other direction? The answer seems like it should be black and white, especially if you’re in a place in your life where you are happy, but for Ellen, it is the hardest decision that she has ever had to make. It had been almost ten years since she had laid eyes on him, but one fateful night, on a rainy NYC street corner, she runs into Leo and her life as she knows it may never be the same. Ellen is a freelance photographer, something that she loves, and her husband, Andy, is a lawyer, working for a large firm and hating every minute of it. Andy’s sister Margot is Ellen’s best friend, and the reason why she and Andy got together in the first place. Ellen and Margot met when they were freshman in college and, as luck would have it, roommates. They would go on to room together throughout their college careers, and then again when Margot decided to move to NY and take Ellen with her. Naturally, when Ellen and Andy began dating, Margot was thrilled, especially when comparing Andy to Ellen’s last love, Leo. Andy was everything that Leo wasn’t. He was sweet and courteous, he didn’t think that the world revolved around him, and he was interested in what Ellen was doing and what she had to say. All in all, they were a perfect fit, creating a good life with each other…until Leo came back into the picture. When Ellen runs into Leo on the street corner, her first instinct is to run away, but she finds that she cannot contain her curiosity as to what he has been up to and if he’s still the same person that she once knew. Leo offers her the job of a lifetime, which Ellen turns down, only to be offered the same job through her agent not soon after. Ellen travels to LA with her sister Suzanne – the only person that she has told about Leo – for her photo shoot, and is surprised when none other than Leo is there. This sets off a chain of events – one of which being that she and Andy move to Atlanta to be closer to his family and so he can work with his father in the family business – that leads Ellen to make the decision of her life. Will she stay with her husband despite the not-so-idyllic new city they live in, or will she go back to the one who broke her heart? Love the One You’re With is a tale about a woman in a crossroads of her life, and the way that she goes about dealing with the situation. One may not agree with how she handles things, but, if you were put into a similar situation, would you not at least contemplate doing the same? I love this story because it shows that we’re all just human, we all have faults and weaknesses, some of which – in Ellen’s case – may be stronger than others, but at the end of the day, we make the right choices (one would hope) for our lives, as Ellen does with hers. I leave you with a quote!